6th match of Carlton Mid Tri-Series has been played between India and England at Western Australia Cricket Association Ground, Perth today. In a do or die match for Tri-series final, India knees down against England and lost the match in 46.5 overs by 3 wickets. JWA Taylor (England) declared man of the match for his useful inning of 82 runs and gave England needed win for Tri-series 2015 final. England will play Final match against Australia. Earlier, England won the toss and elected to field first. India putting into bat first, started inning with AM Rahane and S Dhawan confidentiely. Both played well and added 83 runs in 20 overs before Dhawan lost his wicket scoring 38 runs. But, Sudden dismisslas of V Kohli and SK Raina in quick succession put India in trouble. India could not back in game till end and managed to put 200 runs at the end of 48.1 overs. India's middle orders flop-show continued and gave England very ordinery total of 201 runs to achieved for qualifying for Final against Australia. Following target of 201 runs, England could not made batter start and at one point in 18th overs they were 66/5. 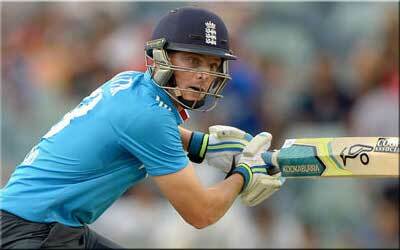 But, JWA Taylor and wicketkeeper batsman JC Buttler took the charge in hand and put England in winning position. JC Buttler made important 67 runs followed by JWA Taylor's very well 82 runs. England registered win in 46.5 overs by 3 wickets.